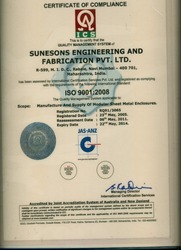 Established in year 1989, Sunesons Engineering & Fabrications Pvt. Ltd. We manufacture, supply and export a wide range of enclosures and allied accessories. The various products offered by us include motrcon - Drawout Motor Control Centre Panel Enclosures and Accessories, Modulo – Modular Enclosures, Electronic Racks and Sub-racks. Additionally, our export range includes motrcon - Drawout MCC Enclosures & Accessories and Water Chillers. We have been successfully operating and flourishing due to our understanding of customer requirements and ability to meet them to perfection. Our constant endeavour is to collect customer feedback and suggestions, and incorporating them into our solution suite to upgrade our offerings. This has enabled us to gain the trust of a large number of clients and convert them into our valuable patrons. Our future plan includes setting up an additional manufacturing factory at Khopoli, Raigad (Maharashtra). Under the able guidance of our mentor, Mr. Amalendu Sil, we have been able to create a niche in the market. It is due to his efforts that we have gained prominence in the market.Our mission at Sunesons Engineering & Fabrications Pvt. Ltd. is to manufacture technically superior, quality conscious and cost effective products to cater to the growing demand for Modular Sheet Steel Enclosures for the Electrical and Electronics industries in our country and abroad. We strive to provide our clients with the best of service and make the extra effort to ensure timely delivery and uphold our commitment towards our client at all times. Manufacturing and Trading of Panel Enclosures and Accessories. Our mission at Sunesons Engineering & Fabrications Pvt. Ltd. is to manufacture technically superior, quality conscious & cost effective products to cater to the growing demand for Modular Sheet Steel Enclosures for the Electrical & Electronics industries in our country & abroad. We strive to provide our clients with the best of service & make the extra effort to ensure timely delivery & uphold our commitment towards our client at all times. We are a quality oriented company, with strong focus on delivering the best products, support and services to our clients. To maintain our name in the industry, we carry our all our business operations in such a manner that preserves the quality of the products. With our clearly laid down quality policy, we ensure that no stone is left unturned in delivering optimal solutions. We offer a comprehensive range of products to our customers, which have been manufactured by us under strict quality controlled environment. All our products are in adherence with the various quality standards. These products are available at highly reasonable prices which makes them a premium choice for our customers. We are also engaged in offering services. Our services are properly executed by our professionals as per the demands of our clients. Top quality is not an end in itself. It is an economic factor. That's why we at SUNESONS priorities outstanding quality control This process starts with strict product quality management base on ISO 9001:2008 processes & goes right the way through to comprehensive monitoring by independent institutions who check our production plant, our quality management & our processes. This bears testimony to our commitment to supply you with reliable products at all times. Our approvals matching international standards offer you the assurance that you can use our products any where in the world. Quality is ultimately the only long term guarantee of our success. We believe that it is the genuine and dedicated efforts of our team members that form the backbone of Sunesons Engineering & Fabrications Pvt. Ltd. Our team consists of pro-active and skilled engineers and designers who work tirelessly to ensure that all the needs and requirements of our customers are met. They work in close quarters with other in a harmonious manner to carry forward the name of the company to great heights. Our experts are proficient in latest CAD and CAM software that helps them in delivering value added services to our customers for like product design and refinement. To keep them abreast of the latest technological advancements in the industry, we conduct regular training and development sessions.